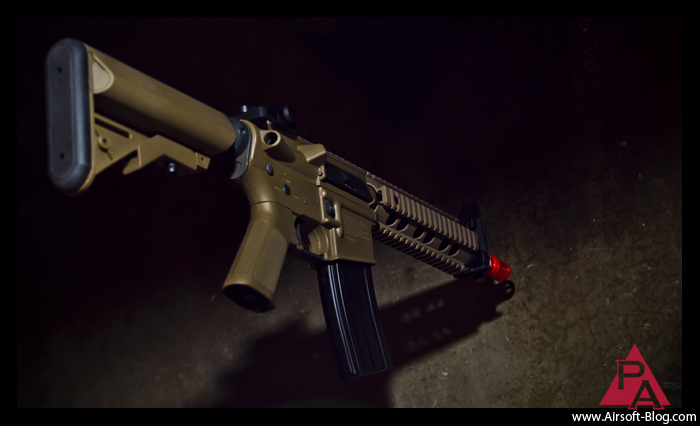 I've now had a chance to play with the two Competition Series M4 series AEGs that Elite Force sent me and can now provide a few thoughts on their performance. 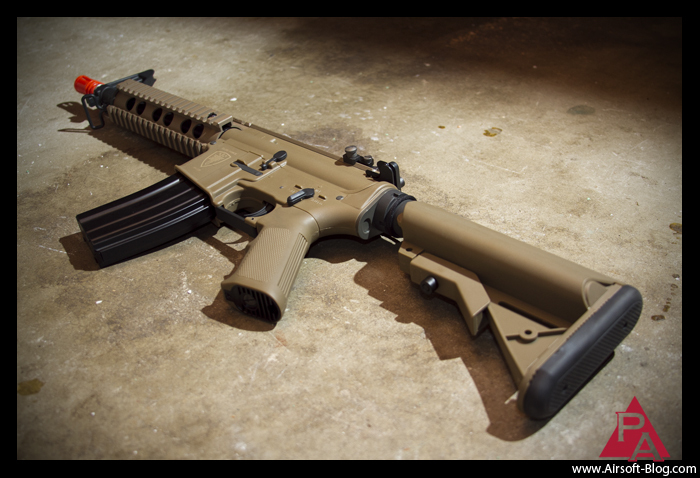 For all practical purposes, they're essentially the same gun internally, so I'm just going to talk about the M4 CQB for today. Overall, I think this is going to be a great gun for a lot of people out there. 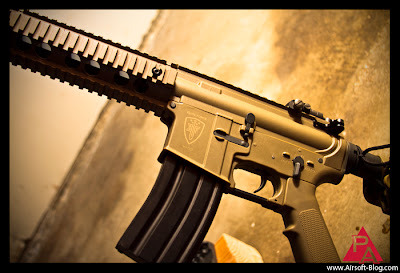 I played with the black, Competition M4 Carbine at OP: Black Shield a few weeks ago and ran the tan/brown Competition M4 CQB a week ago out a Saturday night game at the Insight Interactive Airsoft CQB arena. On both occasions, I had a positive experience with these Airsoft AEGs. 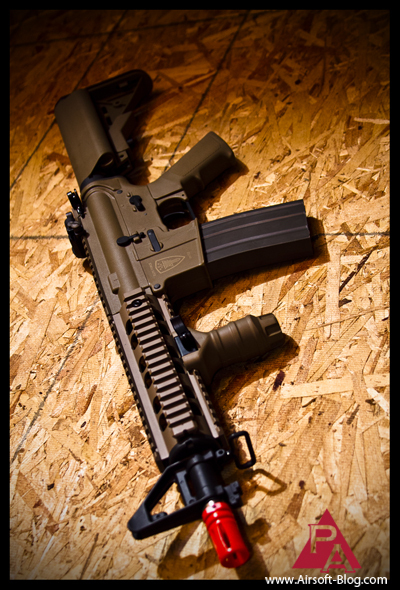 The only issues I had were with the M4 CQB, and they all centered around the back end of the rifle, with the crane stock & buffer tube. When I went to plug in my battery and put it in the crane stock tubes, I soon realized that there didn't really seem to be a way to do so. The back plate of the crane stock, which comes off for most crane stocks, was not budging. So then I tried to take out the knobs on the front of each of the crane stock tubes to no avail, either. Since I was limited on time to horse around with the stock, I just decided to run one of my other crane stocks on this gun so that I could run my two 11.1V stick li-po batteries in parallel to each other like I normally do in my M4s to get more run-time on my rifle before I need to change the battery. However, as if to further frustrate me, the buffer tube on the M4 CQB is slightly too large. My Classic Army E-MOD, VLTOR-style stock barely fit and required quite a bit of force to get on and off (TWSS) while my other standard Classic Army crane stock didn't fit at all. I do realize that there are military and civilian size buffer tubes, so maybe that's what's going on here, but I don't know yet. I'm going to try and fit another buffer tube on there that I know accepts the stocks I've got already. Hopefully, the two tubes will have compatible attachment points. 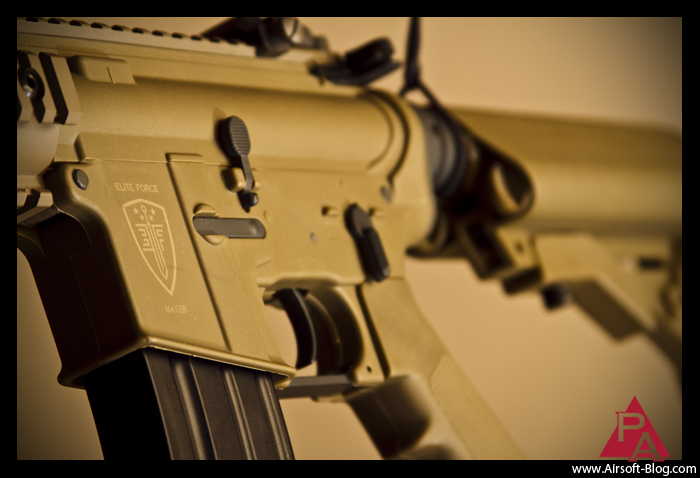 In the whole scheme of things, the stock thing isn't a huge deal, as there are a number of ways you can circumvent the issue with things like a battery bag or just wiring your gun to the front and running a Battery PEQ box on the rail interface system (RIS). But I am positive that there will be a number of players out there that will find this annoying to say the least. I certainly did. So far, I've run the stock high cap magazines that came with the Elite Force M4s, and I've run some King Arms & Echo1 Dogs of War Mid Caps as well. Haven't had any issues that I could attribute to the gun itself. Those particular mids have given me a bit of trouble with feeding, but I think I got them figured out now. I also used some of my VFC & Classic Army High Cap mags and had no feeding issues so more marks in the "Win" column. This gun chronos around 330 fps. I didn't record each shot I took when I chrono'd because I was just checking to make sure it was under 350 fps so that I could take it to play at Insight, which limits FPS to those limits. So that's actually another PLUS point for Elite Force, because I'm seeing more and more CQB-only fields limiting FPS to 350, which is really all you need for that environment. So if Elite Force were to put out a gun that they're marketing as a CQB rifle, yet it shoots closer to 400 fps, that'd be a bit counterproductive. Most of us would then have to decided on a way to go about lowering the FPS in order to be compliant with the 350 FPS limit. This is annoying. I don't like having to take apart my guns to do this, especially since I don't have a lot of time these days to be horsing around with those kinds of issues. 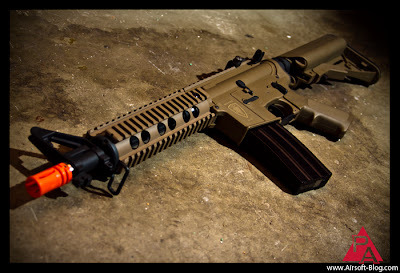 So I'm glad I didn't have to with the Elite Force M4 CQB. 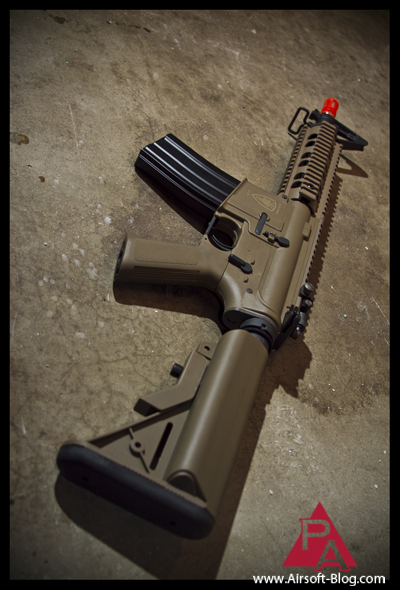 I'd like to get some in-game footage on video with this rifle, but I don't quite have the setup for that just yet. I will be taking this thing apart because I'd like to get a look at the guts. I have a sneaking suspicion that the trigger actually uses a switch, rather than the awful copper contact plates which get burnt out and brittle over a little bit of time and then need to be replaced. So that could be yet another high mark for Elite Force if that were the case. Stay tuned for more on Elite Force Competition Series. If you haven't been to their Facebook page, Elite Force is giving away a ton of stuff for freesies. VFC PDWs, tens of thousands of BBs, and more. They've also got a YouTube channel and Twitter page, so make sure you subscribe to their stuff. 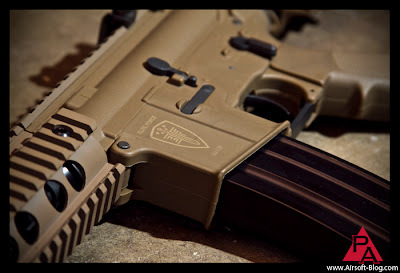 Two Elite Force M4 Competition Series AEGs at the SAME time!